Scientifically, he is a rare specimen known as a DMV local, though he seasonally migrates. Improv melds his passion for jazz, writing, and comedy while being surrounded by funny people. He has indulged in improv and sketch at Washington Improv Theater, Upright Citizens Brigade Theatre, and Dojo Comedy. 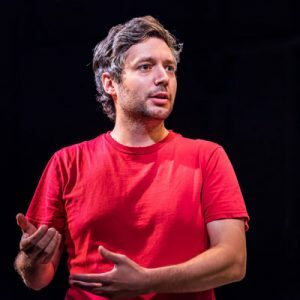 An improv addict and lover of tedious, perfectionist lists, he has also taken intensives and workshops with instructors from Improv Resource Center, Annoyance Theatre, and Magnet Theater. He currently is a lurking member of the unsuspecting indie team Company Blood Drive, and he also produces and performs in The Character Show and The Social Capital Mash. During the day, he teaches 8th grade English and runs a creative writing program. Lately, he has not been keeping up with the Kardashians, but writing liner notes, figuring out guitar chords stacked in 4ths, and becoming despondent about the depreciating value of his Roger Clemens rookie cards.